Over the past two issues of RCM&E I read with interest about the conversion of the new Ripmax KK Ajax laser cut kit to rudder RC. It just tickled the right spot, power being the earliest(rubber) mixed with the latest micro digital electronics. 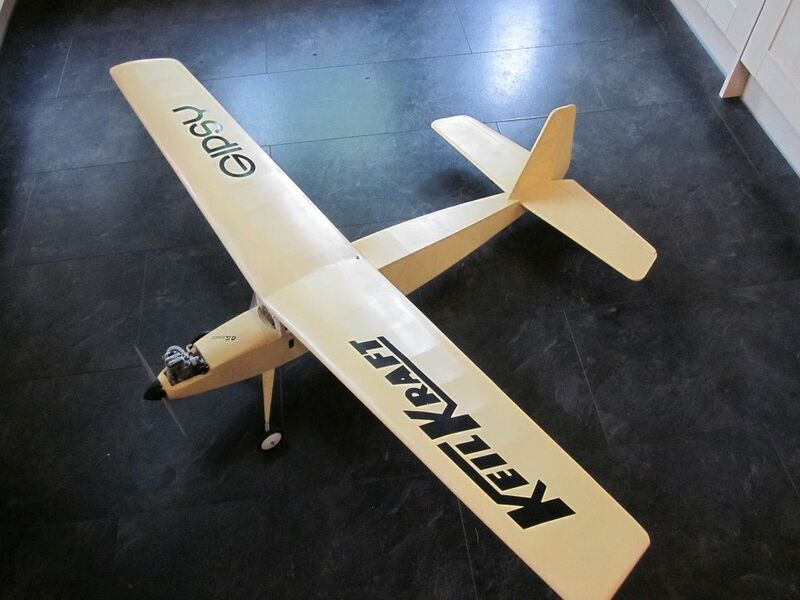 I had previously obtained the KK Gypsy for full elec power and RC conversion as a start in my rehabilitation back into model making after my stroke last year. This has now been relegated in favour of an Ajax. RC gear:- Rx FrSky VD5M(works down to 3v unlike many others that only go as low as 3.7v and weighs 1.6gm); single cell servo 1.7gm(HK-5320) and a single cell 160mAh lipo(left over from Mcx). Total RC weight just over 8gm. A look at the model revealed some aspects that required attention:- single main spare on bottom of wing tends to give 'banana' dihedral, so additional wing spares are required. Single spare tail plane easily distorts so more spares. Add some additional gussets here and there plus a bit of bracing should result in a stiffer and more robust airframe for very little weight increase. Any one else taken a shine to this aspect of our hobby??? The Senator takes my fancy, I have a copy of an original plan & fond memories of building & flying one in my youth. I've got a VD5M, servos, motor, esc & some single cells. The hardware was bought for indoor but never got used when our flying venue became unavailable. Ideally I'd like to be able to use a big dia prop on the Senator but I don't see any practical way to manage that. If you fancy covering your Ajax with tissue over laminating film drop me a PM with an estimate of the length you'd need (it's 12" wide) & I'll send you some film. Oops, I see some spelling errors crept in on my hastily typed post - spares should read spar's etc. PatMc, I've got a role of the thinner doculam in matt but also have a stash of 'lightspan' and 'airspan' from Solarfilm. You may be interested in this thread Senator full conversion Its a full conversion to electric power and RC. I fancy keeping the rubber power for the Ajax that's why I selected the RC items for single cell operation. With electric motive power you obviously have the BEC giving 5V from the ESC and so low voltage RC items are not necessary. Besides the HK-5320 1.7g single cell servos I also purchased some of the normal voltage HK-5330 1.9g servos(at just over £2.70 each for either type it doesn't break the bank to try them out). I must say I'm impressed with the operation of both, especially as the HK-5330 1.9g servos seem to work quits happily on a single lipo cell although they're not rated for the lower voltage. Along with the rubber power RC I think a single channel type Tx(one of Phil Greens emulators, FrSky 'hack' module in a small box with just a button for control. Press and hold gives right, press release press and hold gives left) would complete and complement the 'mix'. Speaking to the model shop when I purchased the kit I was told that the new KK range had been flying off the shelves(pun intended) so perhaps we'll see flocks of them down the field this summer. Even with a full conversion the weight comes well below the 250gm threshold. I have been meaning to do one of these for a while now, this has reopened my interest again, might do the Gypsy but they are all favourites to be honest and will keep them rubber for now but I am sure they can be modified to electric at a later date if required. Jim, you must have put all the RC gear in the tail to balance the weight of a 4st in that long nose. Plus, a little(???) strengthening of the basic structure took place no doubt. Looks an elegant model. 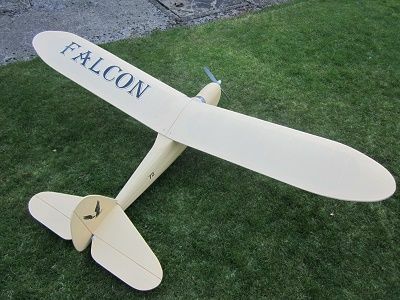 I'll check it out later and let you know,I also did the KK Falcon and scaled it down to 62" from 96" with ASP 30fs up front and as yet unflown. All built with 1/4 " square and 3/32" ribs. When you say "more spars" for the Ajax does this mean an additional spar or making the current one bigger/deeper..
As far as I am aware the original's 2/3 depth spar was done like that on purpose to give a smooth upper surface profile of the tissue between the ribs. Simon, IMO it's not very torsionaly rigid if using one of the plastic tissue substitutes for covering. Plus, the covering sags considerably, on the front of the upper surface, between the ribs spoiling the airfoil shape. Further where the centre section of the wing sits on the fuselage it partly rests on the covering thus potentially giving a variable angle of attack and subsequent trim of the model. So, I would propose installing two upper spars, 3/32" sq,. One half way between the LE and the main spar position and the other the same distance behind the main spar position thus 'balancing' the strength of the main spar and improving torsional rigidity. On the centre section a bottom spar of say 1/8" by 3/32" positioned at the deepest part of the front of the rib would give a positive and repeatable contact with the fuselage. The tail plane just needs more, top and bottom. Say, top and bottom near the front and the same towards the rear in 3/32"sq. Graham Ashby's one came out at 106gm with 20gm of RC. I've saved 12gm in RC weight so I'm hopeful that even with the added balsa I could still achieve sub 100gm.